The chancel of St Mary the Virgin at Preston Candover is all that remains of a medieval church, much rebuilt after a fire in 1681. The rest of the church was demolished when a new parish church was built in 1884. 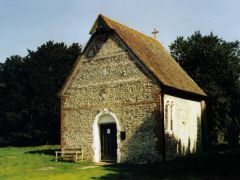 The church probably dates to the late Norman period, but few traces of this early medieval origin remains, apart from a narrow lancet wndow and some medieval floor tiles. There are fragmentary wall paintings, probably 18th century in date, and the interior is replete with memorials. Perhaps the most interesting of these is a floor tablet, incorporating a memorial brass to Katherine Dabridgecourt (d. 1607). Outside the church is a sundial incorporating a Norman base and capital, both installed upside-down! The church is no longer used for regular worship and is in the care of the Churches Conservation Trust, who keep it open most days.